Below is a list of the Herald related documents I have. If you have some documents, stories or Pictures that I don't please get in touch ! The detailed manuals produced by TMC / Philips about the system which was called KBX100 (Pentara / Herald were BT's Marketing Names). These give a surprising amount of detail about the system. Does anyone know of or have any user guides produced as KBX100 documents rather than BT? 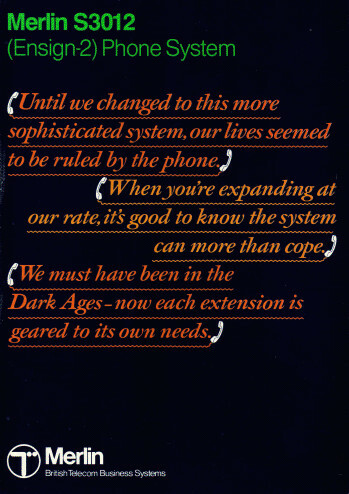 Volume 4 Gives details of a Version 9 software which was never released by BT. This document also indicates that the slimline (Philips style) terminals were produced much earlier than BT introduced them. 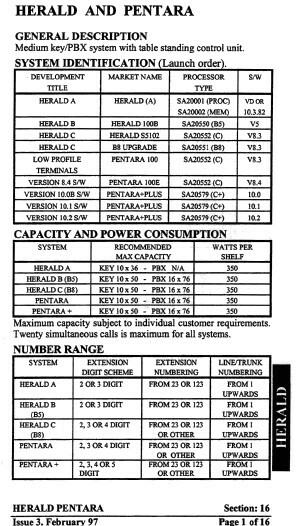 Pentara Programming Manual TD7.3.8F/BTTC HG. PDF version of Pentara Programming Manual TD7.3F/BTTC HG. Thanks to Mike for this. so where are 71-93 and do they go higher ? 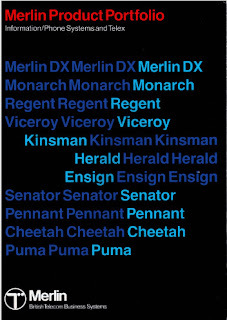 British Telecom's own Monarch - the new advanced all electronic office telephone system (PABX) - is now in service. The first unit has been supplied to Astley and Pearce Limited, the international money brokers based in the heart of London's financial world. And a busy advertising agency is the first company to use Herald, the latest advanced communication system. Smaller than Monarch, Herald is ideal for the smaller office and provides a wide range of new facilities. Receptionist Gill Bergamo (far left) is obviously pleased with her Herald, while Rose Mather of Astley and Pearce gets to grips with the Monarch 120. 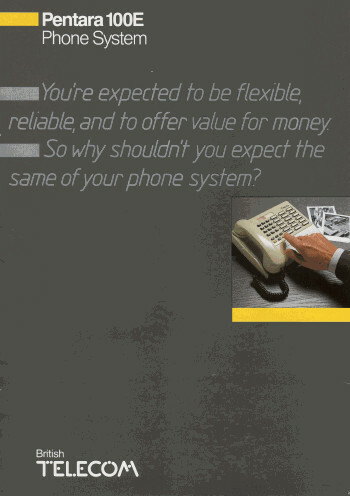 This brochure and the article above shows how advanced the Herald was in 1980. The product was upgraded 3 times and still on sale until the early 90s (1993?). My dad had what must have been one of the first Heralds installed in late 1980. 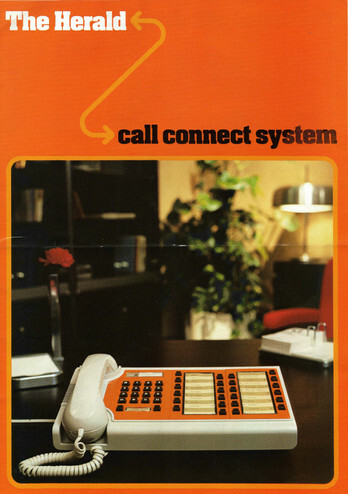 I was fascinated by it as a young boy - no one I knew even had a push button phone in those days! 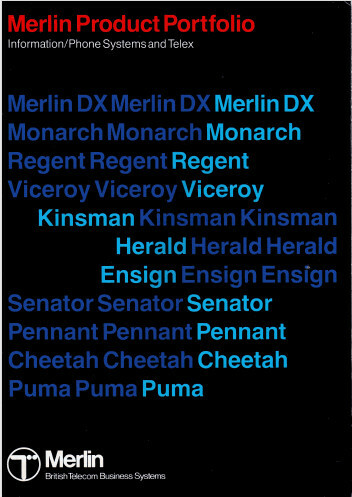 Also why was the Ambassador system not listed? A useful document which lists Pentara codes and all manner of useful information. Of interest are the mention of additional Pentara 10.2 facilities - does anyone know anything about these or have a user guide - or even better the later PDS software that supported these features? As well as POTs (LD only) it supported the basic Herald type terminals TX51, Pentara TX55 and TX56 terminals and also as shown its own low profile terminals based on Viscount phones (presumably made by STC). I have one of these (not in best condition) and it works fine with a Pentara, with all buttons programmable provided the Pentara extension is programmed to not support a display.